Oat Beta Glucan (β-glucans) are polysaccharides composed of glucose molecules in long linear polymers and they are naturally present in fungi, plants, algae and bacteria. Glucans interact with immune cells and have immunopharmacological properties. The results of studies showed that beta-glucan, despite its large molecular size may be capable of penetrating deep into the skin and delivering significant benefits for the skin. After the entery to skin, oat beta-glucan forms a thin film above the stratum corneum and epidermis and promotes sustained moisturization properties together with an improved, smoother appearance of the skin. Interaction between glucan and glucan receptors triggers reactions with fibroblasts that stimulate collagen synthesis. As a result of promoted collagen synthesis, elasticity of the skin is enhanced, wrinkle is reduced, with significant reduction of wrinkle depth and height, and overall roughness, aging process is largely delayed, and the negative effect of radiation is minimized. Glucan added to sunscreens helps in preservation of Langerhans cells so it can be use as an excellent photoprotective agent. It has been reported that topical glucans administration can suport wound healing and be useful for scar care by stimulating tissue granulation, collagen deposition, and re-epithelialization. Oat beta glucan also has anti-inflammatory antioxidant and free radicals scavenging capabilities. Oat Beta Glucan (β-glucans) are non-starch polysaccharides composed of glucose molecules in long linear glucose polymers with mixed β-(1→4) and β-(1→3) links with an approximate distribution of 70% to 30%. The molecular weight of β-glucan varies between 50 and 3000 kDa . Glucans are present in fungi, plants, algae and bacteria . β-glucan is a major component of water soluble cereal fibre and an important part of oat dietary fibre. In oat grains β-glucans are located throughout the starchy endosperm. They are concentrated in the bran . One major source of β- glucan is the baker’s yeast Saccharomyces cerevisiae. In this yeast, β-glucans primarily exist in the (1→3)-β-linked backbone form with (1→6)-β-branches ,. Beta glucans mechanisms of action involve them being recognized as non-self molecules, so the immune system is stimulated by their presence . Human receptors allow the β-glucans to interact with immune cells, such as neutrophils, macrophages and lymphocytes. These interactions activate several intracellular pathways that are responsible for the immunopharmacological properties of β-glucan . 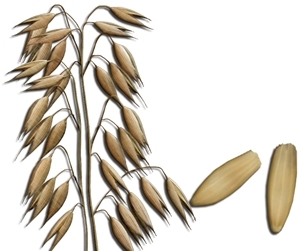 A recent finding show that oat beta-glucan may be capable of penetrating deep into the skin and delivering significant skin benefits, indicated that the skin care actions of oat beta-glucan such as anti-radiation, anti-wrinkle, anti-aging were most likely attributed to its long-lasting and film- forming property, activation of immune cells, and stimulation of deposition of collagen. Penetration studies for oat beta-glucan, performed on human abdominal skin used a single application of 0.5% beta-glucan solution at a dose of 5 mg per cm2. The results showed that beta-glucan, despite its large molecular size, is able to enter the stratum corneum and epidermis and penetrate deep into the dermis. Their experiment showed that 28% of the applied oat beta-glucan entered the skin and around 4% reached the dermis (i.e. the layer where wrinkles form) after 8 hours of treatment with 0.5% beta-glucan solution . Oat has a long history of safe use to provide fast, temporary relief of the itching, redness, and pain associated with many minor skin irritations such as poison ivy/oak/sumac, insect bites, and allergy . In the cosmetic application of beta-glucan, consumers have described various benefits including excellent, sustained moisturization properties together with an improved, smoother appearance of the skin. After the entery to skin, oat beta-glucan forms a thin film above the stratum corneum and epidermis so that a promoted moisturization is achieved . The utility of oat beta-glucan in anti-radiation, anti-wrinkle, anti-aging has been fairly well established. 4% of β-glucan that is able to reach the dermis, activates immune cells, mainly macrophage, through an interaction between glucan and glucan receptors on the surface of macrophage. This triggers several indirect, cytokine-mediated reactions with fibroblasts that stimulate collagen synthesis. As a result of promoted collagen synthesis, the negative effect of radiation is minimized, elasticity of the skin is enhanced, wrinkle is reduced and aging process is largely delayed ,. A clinical study of 27 subjects was performed to evaluate the effects of beta-glucan on facial fine-lines and wrinkles. After 8 weeks of treatment, digital image analysis of silicone replicas indicated a significant reduction of wrinkle depth and height, and overall roughness . It has been reported that topical glucan administration enhances wound healing by increasing macrophage infiltration into the wound milieu, stimulating tissue granulation, collagen deposition, and re-epithelialization, together with increasing the tensile strength of the recovered wound ,. These properties are of special advantage in injured diabetic people, who have increased susceptibility to infection, frequent occurrence of ulcers and delayed wound healing which is in diabetic organism caused by neuropathy, vascular changes and impaired cellular response to injury . A topical combination of β-glucan and an antibiotic as an adjuvant for wound-healing applications seems to be working, which improves epithelialization. One of the topical glucan applications is treatment of decubitus wounds . β-Glucan was recently applied in healing of burns and topical damages. Glucan treated wounds showed a higher number of macrophages in the early, inflammatory stage of repair. Its topical application also stimulates the formation of granulomas, collagen deponing and reepithelialization, and at the same time it increases the elasticity of treated wound ,. Moreover, β-glucans have radio-protective effects, antioxidant properties and free radicals scavenging capabilities ,. Because it is capable of Langerhans cells activations and free- radical scavenging effect, β-glucan could be applied as a photoprotective agent in sunscreens. Its application resulted in the reduction of UV-induced erythema and preservation of the amount of Langerhans cells in the epidermis. Commercial sunscreens prevent burns, but they can not ensure the adequate prevention from several skin cancers, including melanoma. UV-rays cause the loss of Langerhans cells even when the skin is already tanned. In that way, its immunological function is diminished. A combination of a sunscreen and glucan is suggested, because glucan added to sunscreens helps in preservation of Langerhans cells . Solubility: warm water (heat in 'double boiler'), do not boil. Chen J., Seviour R. Medicinal importance of fungal β-(1→3),(1→6) glucans. Mycol. Res. 2007;111:635–652. Manners D.J., Masson A.J., Patterson J.C. The heterogeneity of glucan preparations from the walls of various yeasts. J. Gen. Microbiol. 1974;80:411–417. Goodridge H.S., Wolf A.J., Underhill D.M. β-Glucan Recognition by the Innate Immune System. Immunol. Rev. 2009;230:38–50. Pillai, R., M. Redmond, and J. Roding. 'Anti-Wrinkle Therapy: Significant New Findings In The Non-Invasive Cosmetic Treatment Of Skin Wrinkles With Beta-Glucan'. International Journal of Cosmetic Science 27.5 (2005): 292-292. Web. Portera, C.A., Love, E.J., Memore, L., Zhang, L., Mueller, A., Browder, W., and Williams, D.L., Effect of macrophage stimulation on collagen biosynthesis in the healing wound, Am. Surg., 63 (1997) 125-131.